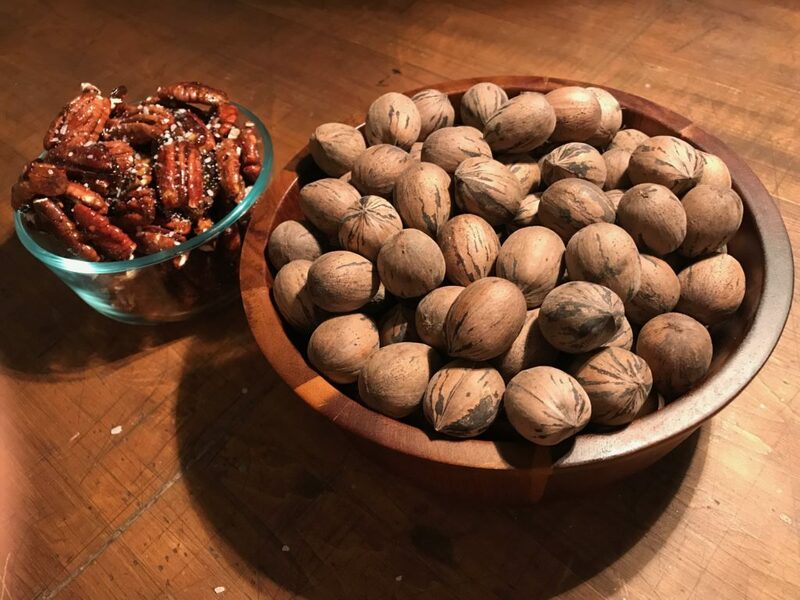 Place out a bowl of salted maple-glazed pecans (see recipe below) when hosting guests, and see how long it takes before it’s empty. The pecan is by far the most popular of America’s commercially grown, edible native nuts. It’s used in numerous recipes and is a popular staple in sweet southern desserts like pecan pie, pralines and butter pecan ice cream. Pecans are grown in 15 states including Arkansas. The top commercial production comes from Georgia, Texas and New Mexico. Pecans are fat-rich, flavorful and sweet. The nuts store well refrigerated or in the freezer but should be used within a year from harvest. 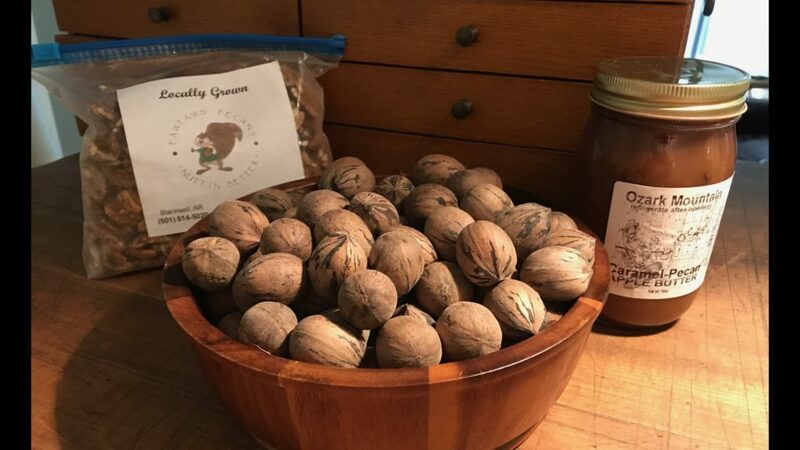 Pecans are often available locally or as an ingredient in locally made products like these hard-shelled nuts,m shelled pecan halves from Conway Co. or caramel-pecan apple butter from Mountain View. April is National Pecan Month, and April 14 is National Pecan Day. 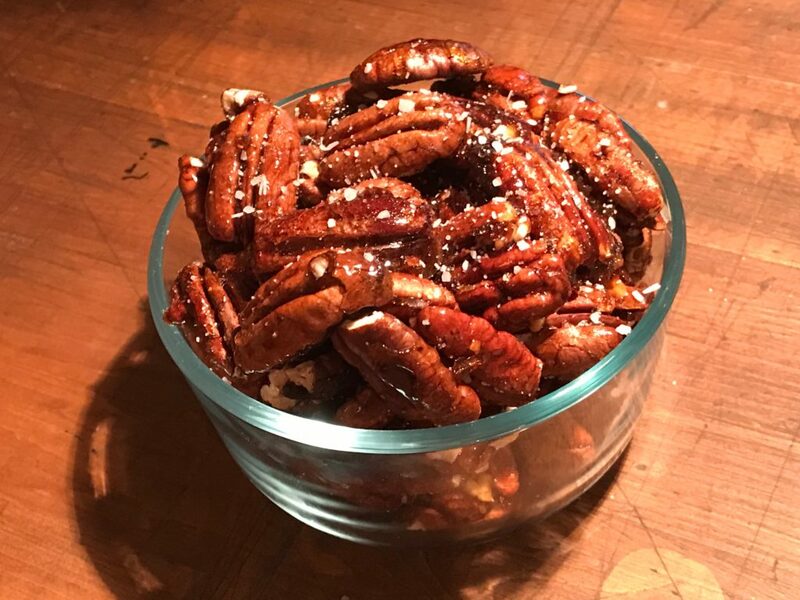 Celebrate this wonderful Arkansas-grown treat by making this easy recipe of salted maple-glazed pecans. I guarantee this tasty, sweet and savory treat won’t last long. Heat the oven to 350 F. Line a sheet pan with aluminum foil and cover with a nonstick spray. Combine the brown sugar and crushed red pepper and dry stir well. Add the pecans and maple syrup a gently stir, completely coating the pecans with the mixture. Spread the mixture onto the sheet pan and bake for 12 to 15 minutes until the glaze thickens, stirring every 4 minutes. Remove the pan from the oven, spreading the pecans on parchment paper. While still warm, use a spoon to separate the nuts and sprinkle them with kosher salt. Allow them to cool completely. Eat immediately, or store in an airtight container in the refrigerator. Stay up to date on local food and Arkansas farming news. Sign up now to receive the Feed E-newslette. For more than 80 years, Arkansas Farm Bureau has stood behind Arkansas farm families in the fields, in the market, and in the legislature. Learn more about what ARFB is doing in Arkansas and get involved.